Reconstructed and renovated about thirty years ago, Old Jaffa's cobblestone paths and winding alleys twist through the massive stone fortifications that surround the city. Old Jaffa was transformed from a slum into an artists quarters complete with galleries, cafes, and shops; yet, few artists can really afford to live in the area. Visitors can follow the walls that snake around the bottom of the city for a look at how this ancient, area is alive with some of the area's best seafood restaurants and nightclubs. The art galleries and high-quality folk craft shops sell fabrics, ceramics, metal works, jewlery and clothes. 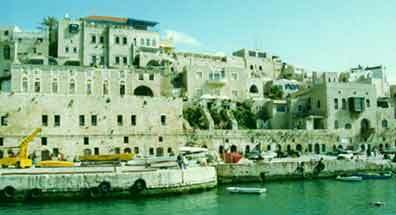 Jaffa is claimed to be the oldest port in the world and was founded by Japhet, the son of biblical Noah. Early Egytian records show that it was conquered by Thutmose III in 1468 BCE. Similarly, archeological excavations in in old Jaffa have uncovered the the name of Ramses II, and was then in control of the Philistines. The Dan tribe settled briefly in Jaffa shortly after the Israelite conquest of Canaan. Later, conquered by King David, cedar trees from Jaffa were used in the building of King Solomon's original Temple in Jerusalem around 950 BCE. Archeological discoveries have shown remains from a Canaanite city, a Jewish city built at the time of Ezra and Nehemiah, a third century BCE wall, a statue of Aphrodite, Hasmonean ruins, and traces of Roman occupation. Following the Babylonian exile in the sixth century BCE, Jaffa came under the control of the Phoenecians and then the Greeks. It was these Hellenistic residents of the city who loaded the small Jewish community in boats and sank them during the Maccabean revolt in 165 BCE. Many myths and tales exist regarding Jaffa. According to Greek legend, it was to one of the rocks on the shore of Jaffa that the god of the sea, Poseidan, chained Andromeda, who was to have been eaten by a sea monster, but instead was rescued by Perseus. According to the Bible, it was from Jaffa that Jonah set sail, before his encounter with the whale, and in Jaffa where Saint Peter raised Tabitha from the dead. One Jewish legend says that all the sunken treasure in the world flows toward Jaffa, and in King Solomon's time the sea offered great riches, which accounted for some of the king's wealth. According to the legend, since Solomon's time, the wealth has once again been accumulating, to be distributed by the Messiah "to each man according to his merits." The Crusaders also came through Jaffa. Richard the Lion-Hearted built a citadel that was promptly taken away by Saladin's brother, who slaughtered 20,000 Christians in the process. Largely abandoned in the Middle Ages, the city regained its importance as a port in the nineteenth century. In the maze of streets the Armenian convent that served as a hospital for Napoleon's troops is still present. Napoleon stopped in Jaffa on his campaign through the country and, according to some sources, ordered 4,000 wounded soldiers to facilitate his withdrawal from the area. At the end of the nineteenth century, the early Jewish pioneers and other western travelers, came to Jaffa when they arrived in the country. Due to treachorous rock, their ships would anchor off the coast and passengars and freight alike would be loaded into small boats. These trips were dangerous and extrememly uncomfortable, but the immigrants kept coming. Jaffa became a city where Jews, Muslims, and Christians lived side by side. In 1909, a group of Jews from Jaffa decided that they wanted to leave the narrow crowded streets of the town. They bought a stretch of sand dunes north of Jaffa and called it Ahuzat bayit, which became Tel Aviv. Nearly all the Jews were expelled from Tel Aviv and Jaffa by the Turks during World War I, but they returned after the British conquest. Arab riots in 1921 spurred Tel Aviv's growth, and it became a separate municipality under Meir Dizengoff. More riots in 1929 caused additional Jews to leave Jaffa for the safety of Tel Aviv. Soon Jaffa became a small village in comparison to the rapidly developing Tel Aviv area, which received city status in 1934. In 1950, Jaffa and Tel Aviv were officially combined into one city. Today, Jaffa is a popular tourist destination because of its beautifully restored old quarter filled with galleries, shops and restaurants. One of the few religious sites is the house of Simon the Tanner, where, according to the Gospels, Peter first realized the gospel message had to be extended beyond the confines of Judaism. You can walk to Jaffa from Tel Aviv, but it's a good forty minutes. The easiest spot to locate in Jaffa is Hagana Square where the clock tower stands, built in 1906 by the Turkish Sultan, Abdul Hamid II, to commemorate his 30th anniversary as ruler. If you head toward the minaret towering over the Mahmoudiya Mosque, you'll find yourself in a Middle Eastern buffet, with cafes and kiosks selling all of the region's delicacies. The Visitors' Center in Kedumim Square has exhibits of archaeological remains and the history of Jaffa. The square is a good place to sit and have a picnic and people watch. At night, bands often play here. The streets off the square are lined with shops, nightclubs and cafes. The violence that began in September 2000 has muted the nightlife in the city and the decline in tourism led many shops to close, but Jaffa remains a beautiful historic area with a spectacular view of the sea and Tel Aviv beachfront. The ancient port is now a modern sailing facility and a tourist attraction with restaurants and entertainment. Rebibo, Joel, ed. Bazak Guide to Israel, 1989-1990. Harper & Row Publishers, New York, 1989. Rogoff, Mike, ed. Fodor's Israel. Fodors Travel Publications, Inc. New York, 1987. Ullian, Robert. Frommer's Israel. MacMillan, USA, 1998.